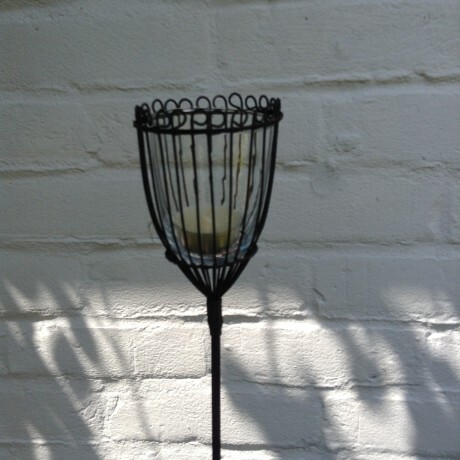 Tall elegant Nkuku Linear garden lantern on a Stake, includes recycled inverted glass lantern to hold a tea light, which fits inside the decorative rustic wire holder. The stakes can be placed securely in your lawn, in a large patio pot plant or in the flower bed. Use your pair of lanterns to create a romantic setting for your garden when dining al fresco. Ideal to light up a pathway by placing the stakes alongside the edges of the path. The Nkuku Kamla Lantern set is also available in a White Border design - You choose! Set includes 2 Kamla Nkuku Garden Lantern Stakes, with a linear design. We have chosen Nkuku as a supplier in the UK because, being a socially responsible company, we share their principles of promoting fairtrade and supporting local community initiatives. In this way we hope to raise awareness of sound business practises in the emerging markets such as Africa.